Caroline Glover founded Annette in the fall of 2016. She named the restaurant for her feisty and brilliant great aunt Netsie, a novelist and short story writer who lived in small town Texas. Netsie didn't teach Caroline to cook, though her tamales and martinis were exemplary. Instead, she taught Caroline to have an opinion. That confidence in her own good taste has carried Caroline through 11 years in the restaurant industry. IN 2017, Annette was named one of the 50 best new restaurants in the country by bon appétit magazine, and caroline and her staff were nominated for two james beard awards, in the best chef southwest and best new restaurant categories. annette was also named denver's best new restaurant and one of the cities 25 best restaurants by 5280 magazine, and was eater Denver's restaurant of the year. Before launching Annette, Caroline spent two years at the acclaimed Denver restaurant Acorn, rising to become a sous chef under executive chef Amos Watts and owner Steve Redzikowski. During her tenure, in 2015, Acorn was named best restaurant in Denver by 5280 Magazine. Caroline is a graduate of the Culinary Institute of America in Hyde Park, New York. 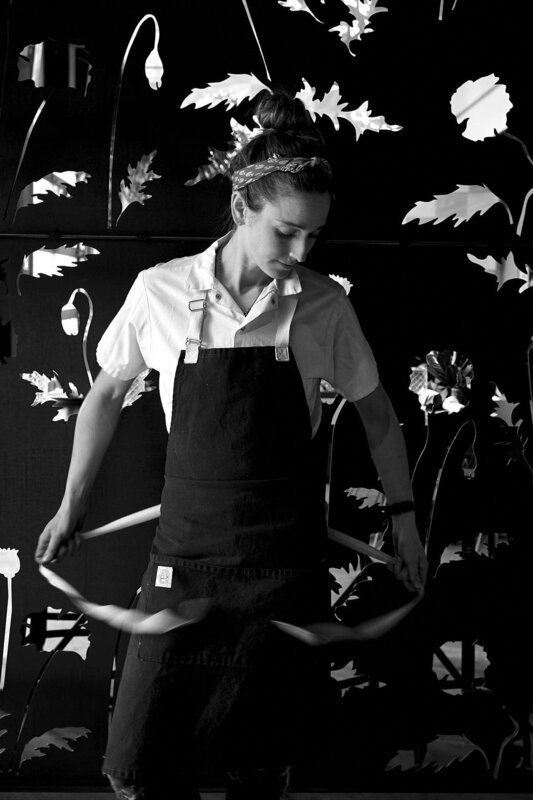 After school, she worked for two years at The Spotted Pig in New York City, a pioneering gastropub run by famed British chef April Bloomfield. She became a sous chef under Bloomfield and executive chef Nate Smith (now a Brooklyn restauranteur in his own right) before leaving to work on farms in Pennsylvania, Vermont and Colorado. Caroline united her passions for farming and cooking in 2011, when she spent a season working at a locavore bed and breakfast in Paonia, Colorado then founded her own farm-to-table supper club while working on a farm in Carbondale. She moved to Denver in 2014, got a dog named Olive later that same year, and married her husband Nelson, a writer, in 2016. Annette is Caroline's first restaurant. TO SERVE DINERS AS THOUGH THEY WERE GUESTS IN MY HOME. TO MAKE A PLACE WHERE PEOPLE CAN SHARE FOOD—AND TELL STORIES—THEY'LL REMEMBER. HONORS FOOD PRODUCERS, NOURISHES EATERS AND EMBODIES CRAFTSMANSHIP, CREATIVITY AND RUSTIC SIMPLICITY. I’VE COOKED ALL OVER THE COUNTRY, AND THAT EXPERIENCE INFORMS WHAT YOU'LL FIND AT ANNETTE. PREPARING SIMPLE, HIGH QUALITY FOOD THAT'S MEANT TO BE SHARED BY PEOPLE I DEARLY LOVE. SIT. DRINK AND EAT. BE MY GUEST.